Title: Women in front of Hong Kong Café. This photograph was collected for the exhibit, “But Women Did Come”: 150 Years of Chinese Women in North America. The exhibit premiered at the Metropolitan Toronto Reference Library in 1987, and brought together two complementary shows, one on Chinese American Women and the other on the history of Chinese women in Canada. The photographs in But Women Did Come document the lives of Chinese women in North America from the pioneer days (beginning in the 1830s) to the 1980s. Included in this database are photographs from Chinese Canadian family albums and Canadian archival institutions. The online version of the Canadian exhibit is available at: http://www.mhso.ca/ggp/Exhibits/Chinese_Women/. 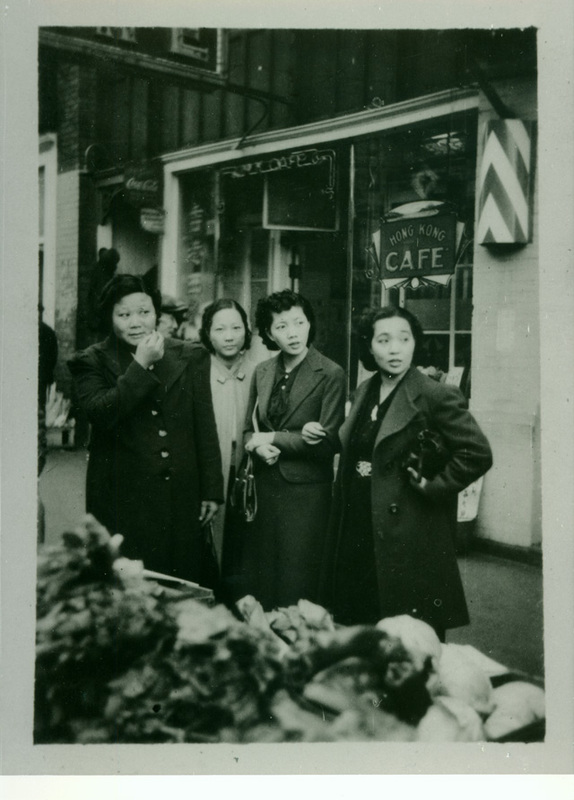 Four women appear in front of the Hong Kong Café, a popular eatery in Vancouver, British Columbia's Chinatown, which reportedly had the longest counter in the city. In 1937, the Hong Kong Café was one of three Chinatown restaurants to have their licenses cancelled because of a law that banned Chinese businesses from hiring white waitresses. Sixteen white waitresses marched on City Hall in protest.